Steve Haladyna (31 points) gets a rare open shot. 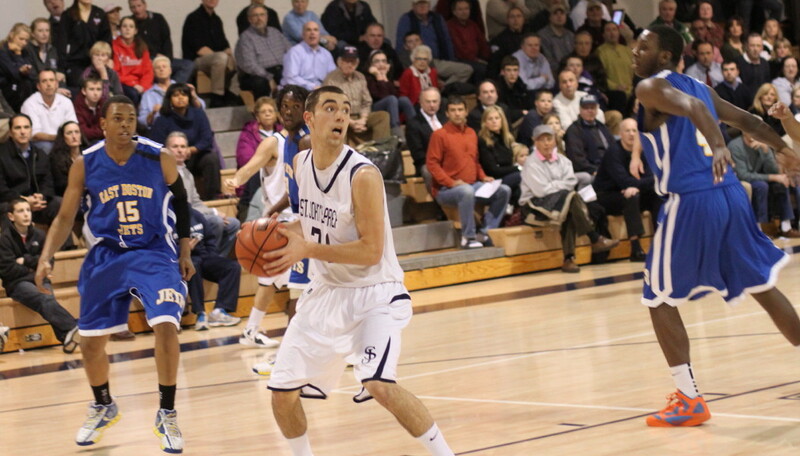 (Danvers) East Boston spoiled the last regular season home game for St. John’s Prep with a 58-52 win at St. John’s. 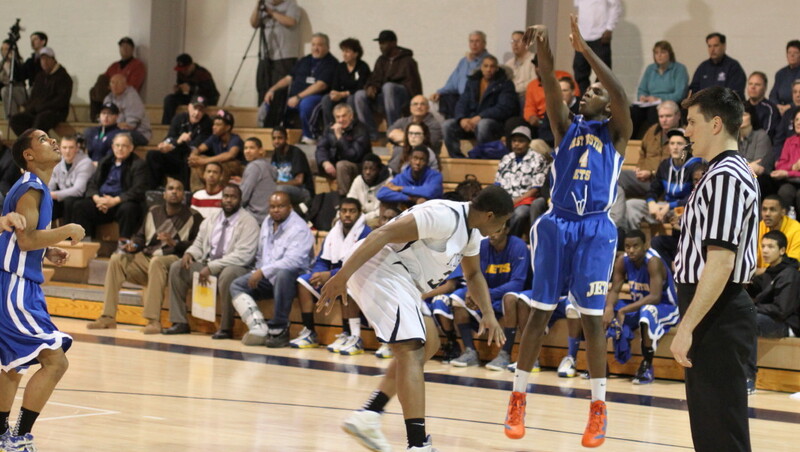 The Jets took the lead for good (10-9) on an Ian Jones three late in the first quarter. The EB spread would get as large as seventeen (41-24) with three minutes left in the third period before the Eagles rallied to make things very interesting down the stretch. Senior Steve Haladyna had a memorable final home game (31 points) that was highlighted by fifteen points in the final period. 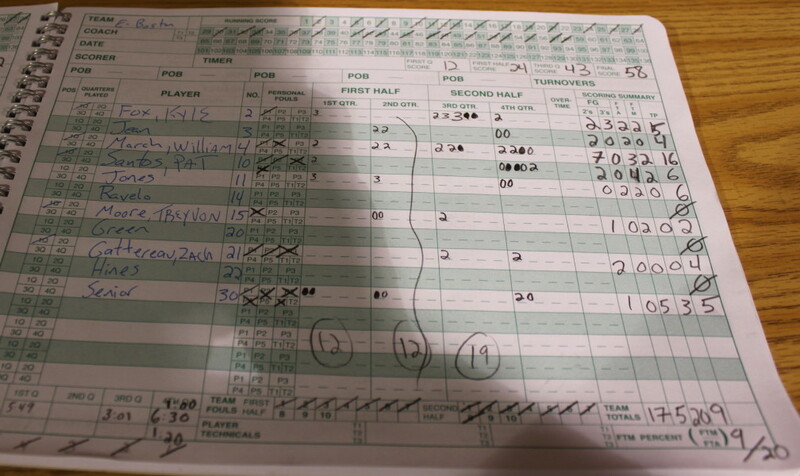 Those points were consecutive and at their end the Eagles trailed only, 52-49, with two minutes left. 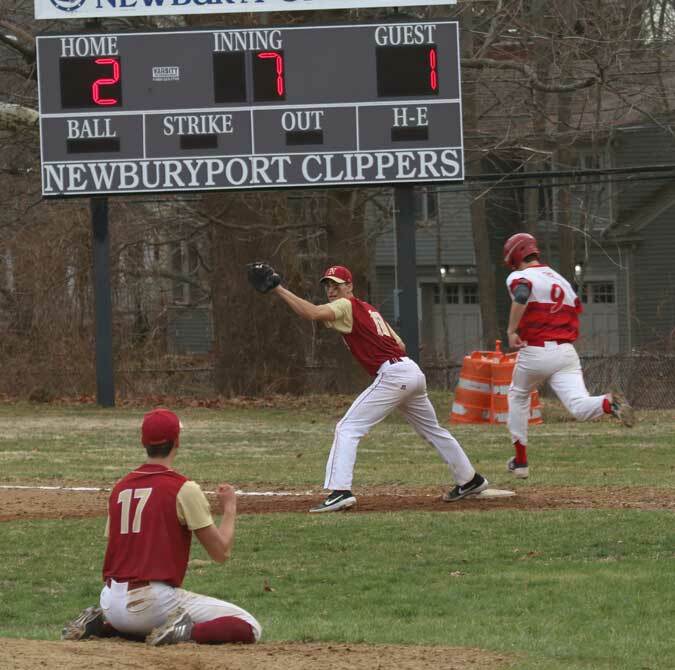 Credit Eastie, they felt the come-backing heat in front of a raucous Eagle student section but had answers. Consecutive points on a free throw by Pat Santos (1:57), a layup by Pat after a scramble (1:20), and a layup from Will March (48 seconds) and the Jet spread was eight (57-49) and in the books for the visitors. 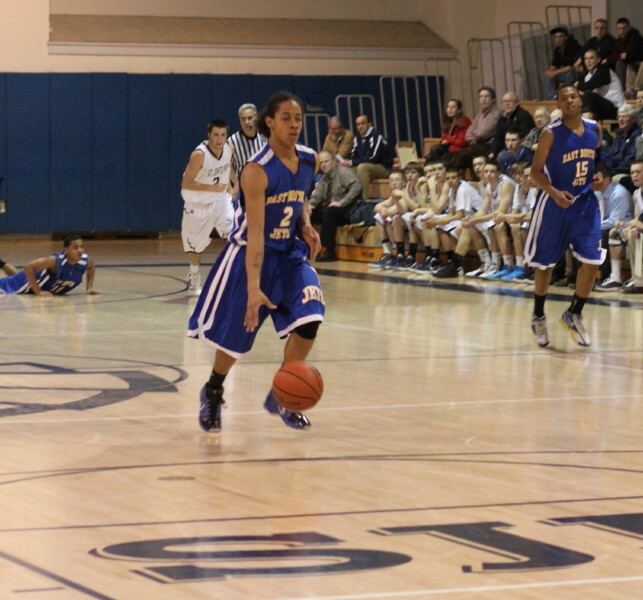 I have seen a number of St. John games and am regularly impressed with their persistent defense. 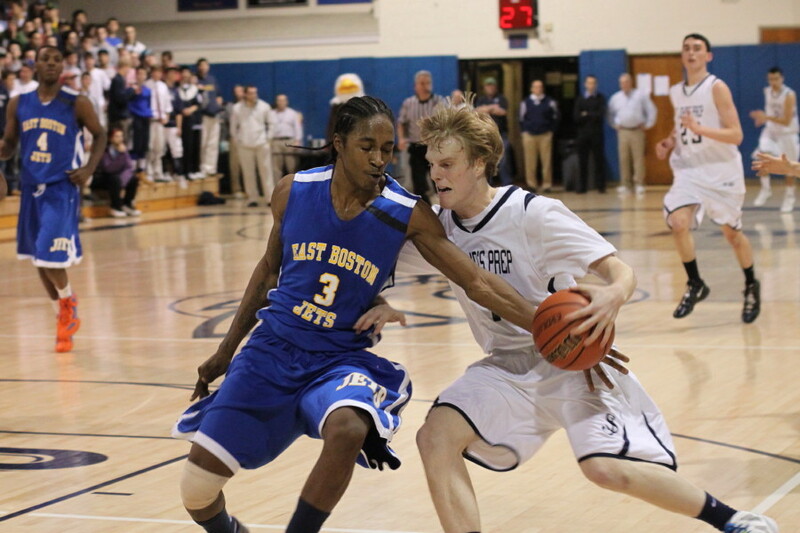 This time the persistent defense belonged to East Boston. Respecting the Jet speed, the Eagles settled into a zone with special coverage on Will March most of the game. 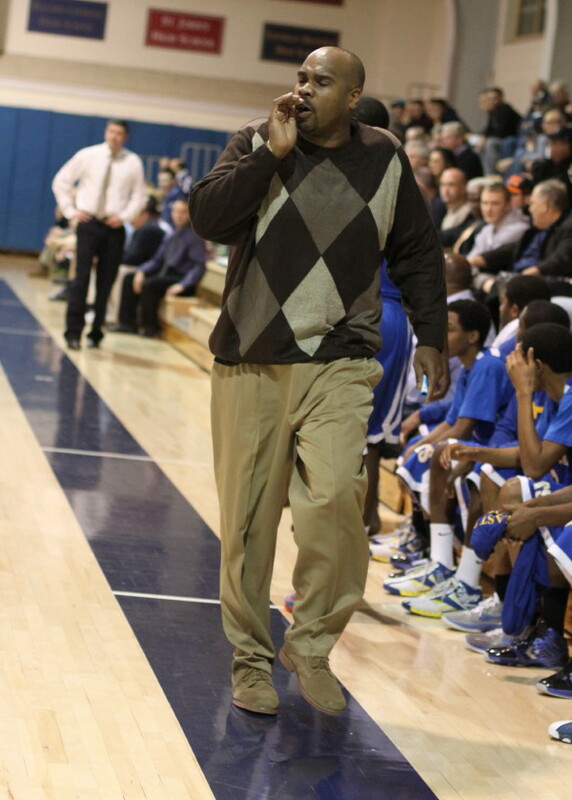 However, when the Steve Haladyna-led run got going it was heavy Eagle pressure that put a scare into East Boston. 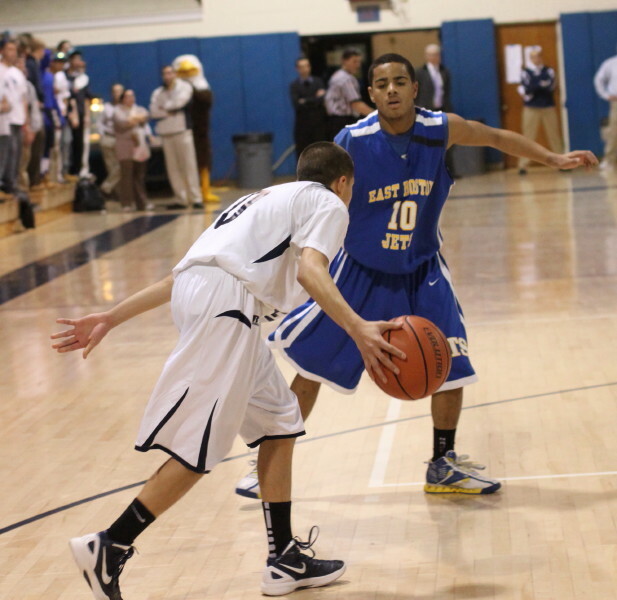 Will March (16 points) and Kyle Fox (15 points) led the East Boston scorers. Kyle drained three long ones. Mike Carbone (8 points) was set up for a three from in front of the student section with the Eagles down three with less than four minutes left. That he missed that one was a surprise to me since I’ve seen him make so many for three seasons. If that one had gone, St. John’s would have been all the way back………but it didn’t and Eastie had enough left to hold their lead. Can an “incident” wake a team up? That may have been the case in this one. A scramble for a loose ball with three minutes left in the third quarter led to some pushing and pulling. Before you knew it, the student section vocals picked up and the St. John’s players got riled up. The glide-to-the-finish mode disappeared and the intensity on both sides picked up considerably. Who benefited? Definitely the senior-honoring Eagles. Over the next 5 ½ minutes of playing time extending into the fourth quarter, the Eagles put a 21-7 hurt on the Jets and climbed to within two (47-45). 3 ½ minutes later, St. John’s was still one shot away (52-49) but Eastie didn’t cave in and came away with the W.
St. John’s (10-6) has qualified for the MIAA tourney but is a long way from last year’s team led by Pat Connaughton. If Steve Haladyna can find some scoring help maybe the Eagles can make a run in the tournament. East Boston (14-4?) was impressive. Not too many teams perform very well in front of noisy Eagle partisans but Eastie jumped in front significantly early to take the crowd away. 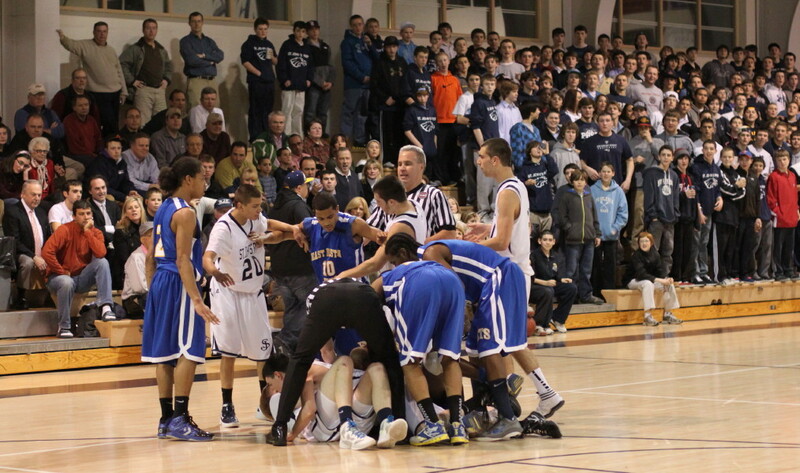 And when things got close, and the fans got involved, Eastie was able to hold not fold. 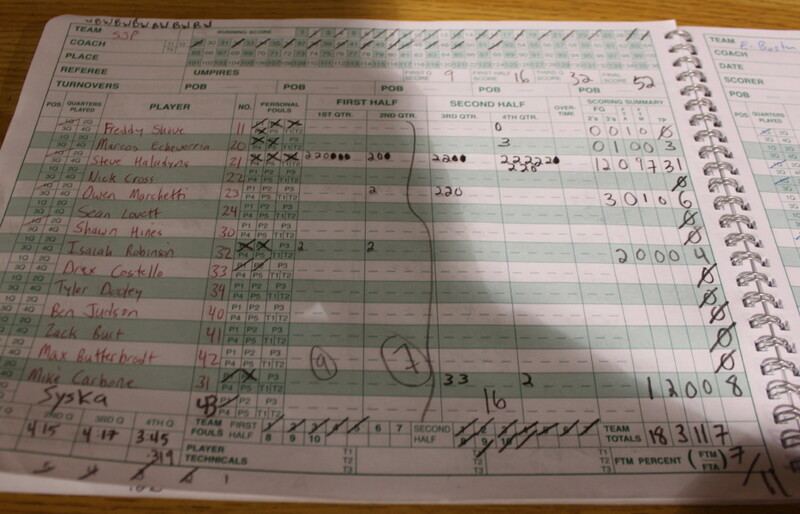 The program provided had players’ numbers incorrect and at least one player unlisted. Try identifying pictures with that handicap!